Russian photographer Yuri Kozyrev and Dutch photographer Kadir van Lohuizen joined forces to document the industrialization and militarization of the Arctic. Their photographs are currently at an exhibition, Arctic: New Frontier, in London’s Saatchi Gallery. 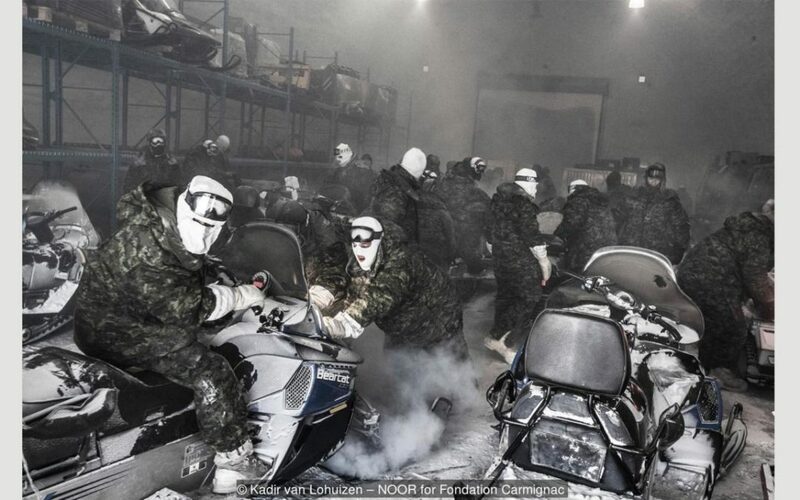 This photo, by Kadir van Lohuizen, illustrates how the Canadian military keeps snow mobiles at the ready in freezing temperatures. Yuri Kozyrev traveled with an indigenous group in Siberia. The Nenets travel with their reindeer over many hundreds of miles every year as the seasons change. The year he traveled with them, the group was unable to make it to the northern summer feeding grounds because of climate change impacts to ice and permafrost. For more stories and photographs, check out this article on the BBC about the project.